Responsible for the FBI Dive Team in Los Angeles, retiring in 2014 and moving to Rio De Janeiro, the host city for the Summer Olympics in 2016, BOBBY CHACON said it was the CBS case in New York that was the game changer for FBI Dive Team. Born in New York. CHACON entered the Bureau through the FBI’s New York Division–joining the FBI Dive Team in 1995. 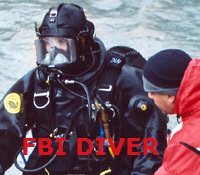 Becoming the team’s first full time diver and leader, he was instrumental in setting up protocols for FBI Dive Team and establishing the FBI’s National Underwater Forensic Program. His experiences include being deployed as a diver to the 1996 Summer Olympics in Atlanta, the search and recovery effort of TWA Flight #800 and a 9-month TDY assignment to Athens to assist the Greece Government with the 2004 Summer Olympics. Reviewing 1982 news accounts of the CBS case CHACON talked about we learned, searching the WACKAACK CREEK, a coastal tributary whose tide flows were influenced by New Jersey’s RARITAN BAY, the ad hoc FBI Dive Team made a very important discovery, buried in the brown mud, Bureau divers found two  spent .22cal shell casings. The FBI Dive Team had hoped to recover a silencer and a .22cal pistol used just days earlier to execute a woman and three  CBS employees, but finding the shell casings … agents thought they now had a suspect. Witnesses said the CBS technicians were killed when they stumbled on the crime, not realizing a woman had just been assaulted. Walking to their parked cars, police said the men encountered a dark shadowy figure placing a woman’s limp body into a van. “What did you see,” he shouted, witnesses said. But then not waiting for an answer, the gunman shot the nearest CBS employee dead and then pursued the other two , shooting each in the back of the head as he caught up to them. Then, having put the woman’s body into the van, he zipped past witnesses and parking lot attendants—speeding down a winding narrow ramp—escaping into rush hour traffic. Responding to 911-calls about shots being fired, police discovered a grisly murder scene, finding three  dead CBS workers, scattered spent shell casings, sunglasses and shoes discarded on the payment and a number of blood stains suggesting the woman had been wounded. Searching the steel and concrete structure jutting out into the Hudson River located at West 54th Street and 12th Avenue [Pier-92], police found three  spent .22cal shell casings near the three  dead CBS workers. The woman’s body was found in lower Manhattan, dumped in an alley. She had been shot in the head with a .22cal bullet. The woman was identified as MARGARET BARBERA, the former Controller at the CANDOR DIAMOND COMPANY [CDC], who only 18-days earlier had agreed to testify against the company’s CEO, IRWIN M. MARGOLIES, suspected of defrauding almost $6 million from the company’s creditors including the JOHN P. MCGUIRE & COMPANY. Discovering BARBERA’s body, authorities reopened the investigation concerning JENNY SOO CHIN, another former CANDOR employee and bookkeeper, who only months earlier disappeared following a meeting with BARBERA. Her blood stained vehicle was found in Manhattan’s Lower Westside and inside the car, police found a like spent .22cal shell casing, which lab experts said was fired from the same gun that killed the CBS employees. Unlike BARBERA, police never found CHIN’s body. Within days of the murders, agents and police started looking at DONALD J. NASH, age-46, residence 81 Creek Road, Keansburg, NJ as a possible suspect. Using the alias DONALD J. BOWERS, agents discovered he rented the parking space next to BARBERA. On the evening the murders occurred, authorities said NASH waited for her in the parking garage—sitting quietly in his van. Wanting BARBERA to enter the vehicle from the passenger’s side, making it easier for him to grab her, police said NASH jammed the lock on the driver’s side with thin wooden slivers. Thinking they needed more evidence, agents targeted NASH using a multi-state Bureau surveillance team when he was arrested by the Kentucky State Police [KSP] driving the suspect van. Searching the van, agents recovered another .22cal shell casing which experts said also matched the .22cal shell casings found in the parking garage, CHIN’s abandoned vehicle and in the WACKAACK CREEK located behind NASH’s home in Keansburg, NJ by the FBI Dive Team. And executing a search warrant in the home of NASH’s nephew, THOMAS DUANE, police said they recovered another .22cal shell casing that likewise matched all the other shell casings, which experts said was fired from the same gun used in the four garage slayings and CHIN’s presumed homicide. Following a lengthy trial, NASH was found guilty of executing BARBERA and murdering the three  CBS employees using a .22cal pistol. He was also convicted of conspiring to kill JENNY SOO CHIN, the former bookkeeper at CONDOR whose body was never found. NASH was sentenced to a minimum of 100-years in state prison. Prosecutors said MARGOLIES paid NASH $16,000 for executing BARBERA and CHIN and an additional $5,000 for killing the three  CBS employees. Pleading guilty to defrauding MCGUIRE, a U.S. District Court Judge gave MARGOLIES a 28-years federal prison sentence, with his wife MADELEIN pleading guilty to several lesser charges serving a three  year sentence. MADELEIN was not charged with either contract killing and/or the CBS murders. Locally, MARGOLIES was prosecuted for killing both MARGARET BARBERA and JENNY SOO CHIN and conspiring to have them murdered. The Indictment identified NASH as being the contract killer who murdered BARBERA, but he was not listed as being CHIN’s killer. In a second indictment MARGOLIES was also prosecuted for conspiring to kill DAVID BLEJWAS, the attorney for the MCGUIRE COMPANY who vigorously pursued litigation against MARGOLIES in the CANDOR bankruptcy. Presenting their case, prosecutors said MARGOLIES made a $2,000 down payment to initiate the plot to kill BLEJWAS stating the agreement called for the killer to get $15,000. Federal authorities identified the purported killer as an inmate serving time with MARGOLIES in New York’s Metropolitan Correctional Center. Not previously disclosed, trial testimony reflected in an effort to derail the federal investigation MARGOLIES defrauded creditors, prosecutors said it was his attorney, HENRY OESTERICHER, who made the arrangements with NASH to have BARBERA and CHIN killed because MARGOLIES thought the women had agreed to cooperate with federal authorities and testify against him. Despite destroying records, MARGOLIES thought BARBERA still had records indicating he orchestrated the fraud scheme. Given immunity OESTERICHER testified at MARGOLIES behest he hired NASH to commit the murders. Following his conviction, on June 21, 1984, a NY State Supreme Court Judge sentenced MARGOLIES to two  consecutive terms of 25-years to life [or 50-years] for murdering the two women, and a third concurrent sentence totaling 8 to 25-years for the conspiracy. The state prison sentences were to run only after MARGOLIES was released from federal custody for engineering the fraud scheme. Unlike NASH, he was not prosecuted for the CBS murders and he was “acquitted” on the charges he conspired to murder BLEJWAS, the attorney who pursued allegations he defrauded creditors in the CANDOR bankruptcy. Finding the aforementioned .22cal shell casings was a pivotal moment for agents looking to establish a full-time FBI Dive Team, since it was first time the ad hoc FBI Dive Team was used to conduct a criminal investigation. Discovered in the WACKAACK CREEK, the .22cal shell casings bolstered evidence identifying NASH as the trigger-man in the slayings—making the case agents needed an FBI Dive Team to collect evidence and conduct investigations. Before the MARGOLIES case [and the CBS murders], the ad hoc FBI Dive Team had only been used to assist agents conducting security and organized crime investigations—needing assistance conducting technical surveillance which generally was not discussed or disclosed in court. But with five  people being executed, including two federal witnesses and three bystanders, Bureau executives became convinced they needed an FBI Dive Team, particularly when they realized—recovering evidence—agents needed protocols so they could work safely and effectively in a dangerous environment, whether it be in the deep ocean, a tidal swamp like the WACKAACK CREEK, or the dark murky waters of a deep river or lake. See New York Times article captioned, “Bits of Evidence Are Focus in the CBS Killings,” written by SELWYN RAAB, dated April 24, 1983, pages 1 thru 3. See New York Times article captioned, “3 CBS Workers for CBS Are Shot to Death,” written by ROBERT D. MCFADDEN, dated April 13, 1982, pages 1 thru 3. See New York Times article captioned, “New Jersey Man in the CBS Case Agrees to Return,” written by SELWYN RAAB, dated April 21, 1982, page 2. See New York Times article captioned, “Jailed Jewelry Executive Indicted in 2 Murders Linked To CBS Case,” written by E. R. SHIPP, dated July 19, 1983. See New York Times article captioned, “Trial in CBS Murder Case to Begin Today,” written by SELWYN RAAB, dated March 21, 1983. See New York Times article captioned, “Jailed Jewelry Executive Indicted in 2 Murders Linked To CBS Case,” written by E. R. SHIPP, dated July 19, 1983, page one . See New York Times article captioned, “Trial in CBS Murder Case to Begin Today,” written by SELWYN RAAB, dated March 21, 1983, page two . See New York Times article captioned, “New Jersey Man in the CBS Case Agrees to Return,” written by SELWYN RAAB, dated April 21, 1982, pages 1 thru 2. See New York Times article captioned, “Newly Found Shell in Jersey Tied to CBS Murders,” written by SELWYN RAAB, dated May 6, 1983, pages 1 thru 2. See New York Times article captioned, “Jailed Jewelry Executive Indicted in 2 Murders Linked To CBS Case,” written by E. R. SHIPP, dated July 19, 1983, pages 1 thru 3. Information obtained from the FBI’s website at www.FBI.gov in document captioned, “FBI Dive Teams: Underwater Evidence Collection,” dated August 5, 2005.